The lenses are designed to be paired with compact heads up display (HUD) units – glasses that allow images to be projected onto their lenses. Much bulkier HUDs are already deployed by the US Army and Air Force to superimpose data about targets and other status updates over users’ views. The tech could help troops enhance their awareness on the battlefield. The iOptik system’s developer, Innovega, told the BBC it had signed a contract earlier this week to deliver a fully-functioning prototype to the Pentagon’s research laboratory, Darpa. The US Department of Defense had previously funded part of the Washington-based firm’s initial engineering work on the project. "The new contract gives us an immediate opportunity to start prototyping and demonstrating elements of this new system," Innovega’s chief executive Steve Willey said. The lenses work by allowing the wearer to focus on two things at once – both the information projected onto the glasses’ lenses and the more distant view that can be seen through them. They do this by having two different filters. 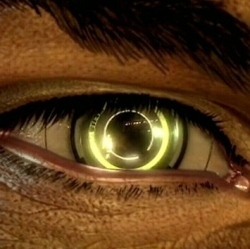 The central part of each lens sends light from the HUD towards the middle of the pupil, while the outer part sends light from the surrounding environment to the pupil’s rim. The retina receives each image in focus, at the same time. "Normally, for example, with a camera you focus on something distant or something close – but you focus on a particular spot," said Mr Willey. "By wearing our contact lens you automatically have this multi-focus, or dual-focus, and you are doing something that humans don’t usually do." The chief executive said he also hoped to license the technology to be sold to the public. One suggested application would be to allow users to watch what appear to be big-screen 3D movies on their glasses – with a different image projected to each lens. Other potential uses include augmented reality eyewear similar to that teased by Google in its recent Project Glass demo, and a device to offer gamers a more immersive experience. The lenses are still going through clinical trials as part of the US Food and Drug Administration’s approval process, but Mr Willey said he was confident the tech should be available to the public towards the end of 2014.